in person, live in San Francisco. INFORUM at the Commonwealth Club of California brings you inspiring talks with leaders in tech, culture, food, design, business + social issues. They’re fun and open to the public – for everyone. Learn when incredible speakers and events come to San Francisco. Be in the know when inspiring leaders give incredible talks at INFORUM. Join us! Thanks for signing up to get updates about amazing INFORUM speakers and events coming to San Francisco! 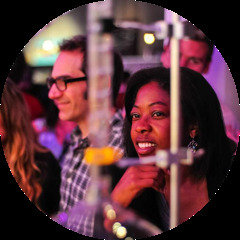 Join leaders in tech, food, design, pop culture, politics & business in-person. Enjoy fascinating talks, amazing debates, and unforgettable activities. Hear the deeper story. Go beyond sound bites with live Q&As, exclusive receptions, VIP dinners, hands-on demos, games, and interactive events. Bring friends, have a drink, and meet other connected people at dozens of curated headline interviews, happy hours, and socials a year. Who can you meet at INFORUM? Sheryl Sandberg. Sal Khan. Nate Silver. Reid Hoffman. James Franco. Arianna Huffington. Marc Benioff. Andy Cohen. Judy Blume. Molly Ringwald. Talib Kweli. Adam Savage. David & Tom Kelley, IDEO. Nicholas Kristof. Chef Mario Batali. Join them & many more. come to the Bay Area. Join US.